For 12 days, we are posting Christmas giveaways in anticipation of the day Jesus Christ was born. Our hope is that these gifts will encourage followers of the blog to focus on the real meaning of this season. 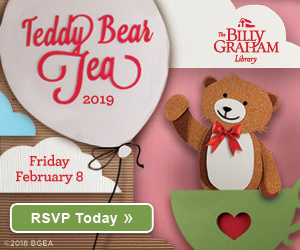 Today’s giveaway includes three items featuring Billy Graham’s wife, Ruth Bell Graham. 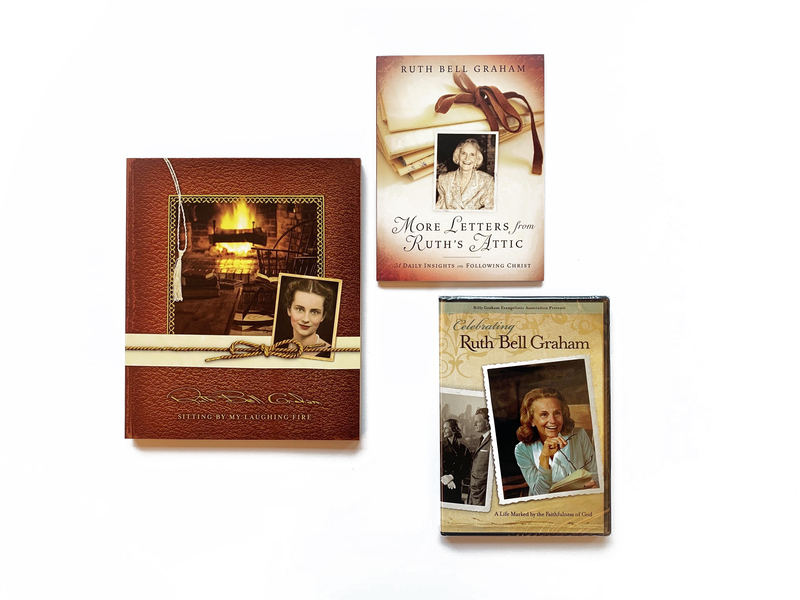 To enter to receive the “Day 4” giveaway, share how Ruth Bell Graham, or any other Christian leader, has inspired you. 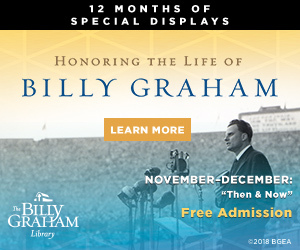 The winner will be chosen randomly from comments received at https://billygrahamlibrary.org/12-days-christmas-giveaways-day-4-2018/ before Thursday, Dec. 6, 2018 at 11:59 p.m. ET. No purchase necessary. Odds of winning depend on the number of comments received. Void where prohibited. My life and my Christianity has been baked, and flourished because of the Grahams life of service to God. I’m like a fresh bloomed spring flower that was nourished through a hard winter. To open in spring with new verses and the Lord’s blessings. 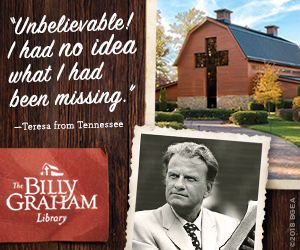 Billy Graham gave me my gardening tools to nurture my soul and garden of Christianity.I am reborn. I’ve been inspired to stay to the faith and keep constant at it as faith will see you through. I think of Ruth Bell Graham often and how she raised the children with her husband being gone so much and how they are now serving God too. I never see or read about how she would get angry with Franklin when he did not obey but found humor by “climbing on the roof and to the window”. She is such an example of a Godly woman. I wish I could have met her. I would love to know how her daily life was with doing wash, cleaning etc. Ruth is such an inspiration! I loved Ruth Bell Graham’s poem / prayer she wrote when she was single about what she wanted in a husband. That was something I wrote out and kept in my Bible for years. I have read and listened to Anne Graham Lotz for many years and her passion for the Lord has inspired me to stay in the word and attend bible studies to learn more about our Lord and Savior! She has encouraged me to press in and work hard to raise good kids with having a spouse that travels a lot. I visited the library last week with my husband and my two toddlers and baby, it was the first time we did the journey of faith. I am often saying how hard it is to get anything done with three kids under four, but when we got to how Ruth Graham was with her children it prompted me to think and be different. It prompted me to start doing more activities and teach them more about God. I think there’s nothing better than to see your children growing up to be in love with God and I want that, what she had how she was, I want that for my kids. I want them to see me as an example to them. Ruth Graham has inspired me to share the message of Jesus with my children o our home. She left a legacy with her children to know Christ and to share the gospel as they grow. She was a beautiful person and such a beautiful woman in Christ. Being a mother is the toughest job I’ve ever had. There is so much at stake and so much reward as well. I remember reading a passage by Anne Graham discussing how her mother would celebrate birthdays and how she worked off of an old door for a desk. I saw how children watch everything you do. I saw how they remember the smallest details. I pray every day that God will help me be a better mother, and wife. Ruth Grahams cheerfulness is a gift to her from God to help her and it appears to have inspired her children and readers as well. The lady that inspires me is my best friend/second mom, Carol. I can talk to her about anything and she won’t judge me, she gives the best advice. She is the closest person to Jesus I will ever meet. I’m crying right now writing this. She’s the best. I’m so glad I met her at church. My life is full because of her. Charles Stanley inspired me to know GOD — what what others say He is, or what others claim He is but to know Him for myself. Ruth Bell Graham influences me still today through her beautiful writing, especially her poetry, and her very real unwavering faith in the Lord Jesus. She was a source of quiet strength and support to her very famous husband, who was often away from home. I am thankful for the life Ruth Graham lived so well and for the inspiration and encouragement her legacy gives to so many of us. Not only has Billy Graham inspired me to live a Christian life but also to acknowledge those who don’t know Christ and reach them. He was called to serve the Lord and he did till the day he went home to be with the Lord. Another person has to be Joyce Meyers. She is amazing in how she has serve the Lord and continues to do so. Everything she went through as a child and still she believed in God and with all that has helped many others overcome trails that they are going through. These two people are just only two that I can say have inspire me. Ruth led by example. She showed us how to be a lady, how to influence and teach the principles of the Christian life when you are raising children- sometimes alone, how to work within a marriage to overcome adversity and how laughter, hard work, perseverance, fun, and prayer are all necessary to succeed. She ministered to so many in so many countries by being herself. She didn’t need to put on a different face, different clothes or different personality to meet the Queen, a neighbor or a homeless person. She let Christ shine through no matter the circumstance. What a priceless example of love, courage, and grace. I accepted Jesus Christ as my Lord and Savior in 1975 at the age of 13. 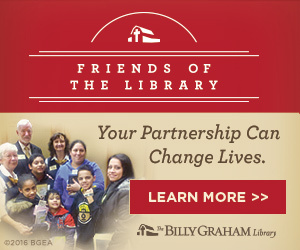 I was introduced to the Billy Grahm ministry through my small Baptist church in Butler Oklahoma. I received mailings from his ministry and that meant so much. Now I’m a bit older and I still love to watch in awe how God worked through this man to reach millions of people. The multitudes that gathered to see him in stadiums with thousands coming forward to accept Jesus. I didn’t realize how much he gave up in his family life and what a strong person his sweet wife was. I am truly amazed how he truly gave his life to serve God. If only I could be so serving! I have 2 of these books and I have always been inspired my “Mother Graham”. She was a remarkable woman and incredably strong to have accomplished what she did while Rev. Graham was traveling and spreading the gospel. Just raising Franklin was a job!!!! LOL….I just had to add a little humor! Franklin is a fine man.